Wonderful! Love the tender smooth crumb. Thanks, Angie. My husband is addicted to this bread! Sourdough. Always liked the sound of that. Like I’m on a cattle drive and just caught up with the chuck wagon after a long day with no food. Despite the rationing of bread in my list of preferences, that one makes the cut for premium meals. Then, too, the slightly acerbic sourness tantalizes the same taste buds as lemon meringue pie and certain Chinese sauces. Sour sensations are ever more delectable the older you get, methinks. Like certain mustards. BUT…it’s over my pay grade to spend much time on preps, so I’ll pass on this. To the store, I go. Put down my dough and they slip me some sour sensations! Sully, I've been a fan of all things sour since childhood. What you say about spending the time on making something like this is typical, but what people don't realize is that it takes longer to read this than to make it! Truly! Under a minute for first feeding, under a minute for second feeding, maybe two minutes to stir up the dough, maybe two minutes to shape the dough. The rest of the time it's just doing *its* thing while you're off doing *yours*! Thank you, Martha Ellen. I hope you'll try your own starter. And my way of maintaining a starter has you storing about a half a cup of it in a half-pint jar and not throwing any away! And you can manipulate the process to make your bread more sour or less sour, whatever you prefer. I recently figured out a way to make it less sour, but we like it "twangy" -- love that word! Hi Jean. This looks great. I like sourdough bread and usually buy the artisan version from a local bakery. I have had a go at making bread myself on a few occasions but not sourdough bread. The times I have read about how to make a ,"starter," and I have not understood it, is innumerable!!!! I might try again following your instructions!!!! Hope you and Mr Delightful are well? The world is a very strange place at the moment isn't it? The usual rules of engagement no longer apply. What does morality and honesty mean ? I will be visiting North America in September. I already have my plane tickets. I am staying with my mate Clive in Toronto. We are getting an internal flight to New York for a few days. We will hit Greenwich Village. I am bringing my copy of Dylan Thomas's complete poems. We intend to drink in the bar Dylan drank in. I will ask if I can do a live reading of some of Dylans poetry. They will either say yes, or, more likely arrest me!! Ha! Ha! Thank you, Tony! Yes, you should definitely try it my way. I have a post about how to make the starter, how to make the round artisan loaves and how to make the sandwich loaves. And, yes, Mr Delightful and I are both well. I'm so glad you and Clive are going to hit The Village together! Can't wait to read both versions of the trip! Hi Jean, your bread looks fantastic, great texture and color and I can see why it is a wonderful morning sandwich bread. But to be honest the recipe is too complicated and time-consuming for me to make. The checking on the yeast every few hours just doesn't sit well with my erratic work schedule. I think I will pass up on this one and wait for you to come up with an easier recipe to follow. I have to say, though, that I found it very interesting to read about the process of making this bread. Thanks, Christina. It's unfortunate that it sounds so much more complicated than it is. It's a really easy thing to manage on a day when you're going to be home most of the day. You have to make it a few times in order to know what to expect in the way of timing. Thanks for commenting. Much appreciated. I am about to commit a crime, Jean - I don't like sourdough bread. That said, I have the feeling that homemade sourdough sandwich bread, like yours, is a completely different story. To show my trust in you, I am planning to start making this over the weekend. Haha - and when I said I was going to start this weekend, I really meant START! I just read through the "make your own starter" section. I think I may not be having homemade sourdough sandwich bread until February! You got that right, David -- February! But I'm thrilled that you're going to give it a go! I'm available for advice and/or cheerleading throughout the process! Yay, team! Oh I'm excited to find this recipe! We have a great artisan bakery in our area that has some amazing bread, but I do enjoy making my own and have never made sour dough bread before. I am certainly going to try this. Thank you for sharing your goodness with us. Debbie, it's a process! And it sounds waaaaaay more complicated than it is! Don't get discouraged. Take it step by step, then after a few times you'll find your "rhythm" and wonder what all the fuss was about! 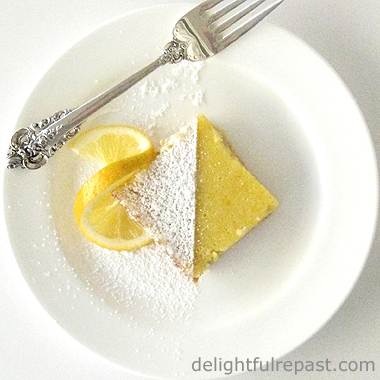 Such a delightful recipe! I loved the basic sourdough idea! I am really bad at baking, let me try step by step and see if I can get it right this time. 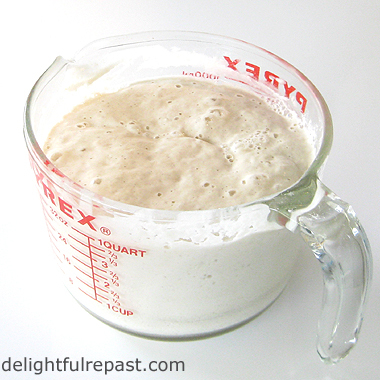 Years and years ago I had a sour dough starter in my fridge and used it regularly. then I got out of the habit of using it and it died. *Sigh* So of course, you're reminding me of 1) how easy it is and 2) how great it tastes! I guess I'm going to have to get back to it! Bet it makes great pizza crusts too. Mmmmm. That's what I use to use mine for. Sally, I've just made my sourdough starter... I can't waiti to try it!!! I have let my poor sourdough starter go dormant. I am going to resuscitate it once we get home -- hopefully, I can bring it back to life. I like this recipe for a sandwich bread. I bet toasted it's fantastic! Have a great weekend. Richard, I leave my little half-full half-pint jar of starter in the fridge and get it out once a week to make my two loaves. Once I left it in the fridge for three weeks, and it was fine. So if I were going to not bake for an extended time, I think I'd just get it out and refresh it every three or four weeks. I'm going to experiment with freezing a bit of it and see what happens to it. I prefer my regular pizza dough recipe that I developed years ago to the sourdough crust I experimented with. I think if I adapted my crust recipe to use the starter instead of yeast, but kept the method and everything else the same, I might quite like it. Manu, that's wonderful. And as your starter develops and changes over time, you'll be intrigued by the whole process. Let me know how it goes! Marisa, I'm sure you can revive it. Just take your time, don't rush it, maybe several feedings. Yes, it makes wonderful toast. My husband has this sourdough toast every single day for breakfast. Lea Ann, I'm so glad you're going to try it again. You're right about the smell of bread baking. There's nothing quite like it. 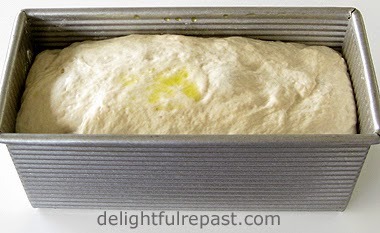 For years I used to make my own bread but that changed when we moved to Santa Cruz. We have the best bakeries with different breads here and I just go and buy it. Your bread looks delicious and I would love to have a piece with sweet butter and jam. Thank you, Gerlinde. I would be tempted to buy it too if we had exceptional bakeries around. But I sort of do it for fun! 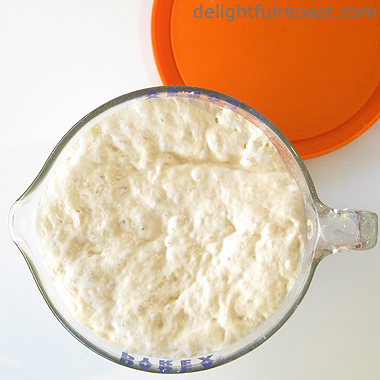 Though this particular bread doesn't require much kneading, I've always found kneading bread dough very therapeutic. Oh, I have to try this recipe of yours, I'm a fan of every kind of bread and I love preparing and cooking loaves, especially in the old oven made of stones we have outside ... of course, we may use it only during the good season, but when it's cold I have my electrical oven that works so good ! Since we live here at Tenuta Geremia I have given boot to some country traditions such as that of making bread on Saturdays ... and during the Holiday Season on our table there's always a loaf of Cottage Bread which is always so little for us all ... truth is that in my family all love bread ! may it be filled with joy and love, Dearest one ! Dear Dany, I'm always glad to see a family carrying on or starting a family tradition of breadmaking, whether in an outdoor stone or brick oven (how I wish I had one of those!) or a standard indoor oven. If you make my sourdough starter and sourdough breads, be sure to let me know. Have a wondrous winter! Oh how lovely. You are a 5 STAR baker! Thanks for sharing. Thank you, Bernideen! I certainly do love to bake. It looks delicious, Jean. I like sourdough bread, I did make it a few times but that was many years ago. Thank you, Kathleen. There are soooo many things I haven't made in many years! Not enough hours in the day! I haven't baked sourdough bread before and would like to try making my own starter, (I read your post about that. ), and give your recipe a try. We are having extremely cold and snowy weather at the moment and dealing with it is taking up extra time but maybe when we get a break I try this bread. Thank you again for all your recipes. Oh, we love our WÜSTHOF Classic 5-Inch Serrated Utility Knife so much that we are wanting to buy a couple more in different sizes. Since we could our current shorter style French knives almost daily we thought we would get one of those and a cook's knife of some size. What do you enjoy using the most out of yours? Thank you again for such a lovely giveaway. This knife is the Best! I love sourdough bread. Freezing one loaf is a great idea! Lily, I'm so sorry you're having such extreme weather. But when it's a bit better ... I know you're going to have fun with the sourdough! Glad you're enjoying the utility knife. I also love my extra-wide 6-inch cook's knife (you can look up my review post of that one as well) and the bread knife. I have the 8-inch cook's knife as well, but I more often use the 6-inch. It's just easier for me to handle. But they're all great. Stay warm and cozy! Hugs! Thanks, Amy. It has really simplified my life! Nice! Why am I always hungry after reading your posts? HA! Aaw, Margie, that's sweet! I guess that's what I should be aiming for, right? This looks super-yum! I'll have to pass this one on to the baker-in-chief, Rick! Thanks for your visits and comments. Sorry you couldn't get the audio going on Rick's "melancholy waltz" -- I checked and it was working on mine so who knows if blogger was having a temper tantrum, if it was a volume thing or what. No matter, the visit is what counts! Thanks, Jeanie! I think Rick would really have a lot of fun with sourdough. Though I've never met him, I'm almost sure of it! And I'll check out the waltz again, but not today because my computer is not being very cooperative today. I love making sourdough bread! Thanks for sharing at #WonderfulWednesday! Enjoy your week. Thank you, Marilyn. Always happy to find another sourdough baker! I have sourdough starter on my counter all the time. One of our favorites bread to make. Thanks for linking up with Blogging Grandmothers. I'm glad to hear it, Candace! This looks really good and I'd love to try it, but where do you get the starter starter? It would also be great if you shared this on our What's for Dinner Sunday link up! Thanks, TLG! You actually make your own starter! And I show you exactly how to do it at the How to Make Your Own Starter post that is linked. I hope you'll give it a try! I missed that link - headed back!! And Thanks for sharing at the What's for Dinner link up! Thank you Jean for partying with us at Blogging Grandmothers Link Party. I shared your post on my social media sites. Thanks, Grammy Dee! Much appreciated. I have always been afraid to try making my own bread. Always seemed waaaaayyyy to hard. But maybe you have removed some of the fear. Some! 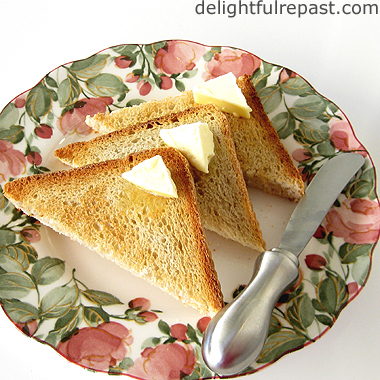 :) Thank you for linking up with us at #blogginggrandmothers. I have shared your post on my social media. :) See you next week. Thank you, Clearissa. How I wish I could coach you in your own (or my) kitchen and convince you altogether! :-) Thank you for sharing on your social media. Much appreciated. I really enjoyed this. I have never made bread from the starters, just the cakes many years ago. I loved those so I bet your bread is delicious. Remember how everyone use to have these starters. Thanks for the recipe. Thanks so much, Pamela! I never made the cakes. But I've always loved sourdough bread. Will be starting to feed the starter tonight for two more loaves! Thanks, Gingi! We looovve sourdough bread! And my husband is simply addicted to this one! I have always wanted to make Sour Dough but I am a little unsure about to make my 'starter'. This is a brilliant guide. You made it all sound so easy and bread is my kryptonite when baking! Kirsty, fear no more! You can DO this! Thanks so much. Your bread looks fantastic, wish I had a slice right now, yummy! Hope you are having a great week and thanks so much for sharing your awesome post with us at Full Plate Thursday. We look forward to seeing you again real soon! Jean, years ago I had a friendship bread starter, and we loved it. But now that I cannot have gluten I am wondering if this would work with a gluten free flour substitute? I'm going to have to check that out, I would love to be able to bake my own gluten free bread and have fresh bread for all of us. Especially with your tips, this wouldn't take that much time and we'd all be extremely happy. Crossing my fingers that it will work. Thank you so much, Miz Helen! I'd like to be going to *your* house for dinner tonight! Nikki, some people who can't have gluten, even celiacs, can actually digest *true* sourdough wheat breads. 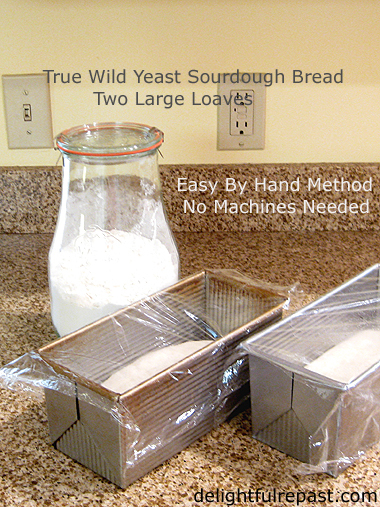 True sourdough breads have no added commercial yeast. You might look into the research. But even if that won't work for you, you *can* make gluten-free sourdough. As always, this looks amazing and if not pure magic, then alchemy at the very least! One day I hope to see you demonstrate some of your wonderful techniques and offer fans a taste of the results! Bread is quite magical, isn't it, Pauline? You bring up an interesting thought: I wonder how I would like doing a demonstration. I'm not someone who likes attention, more of a behind the scenes sort; but it might be fun to teach a small group! 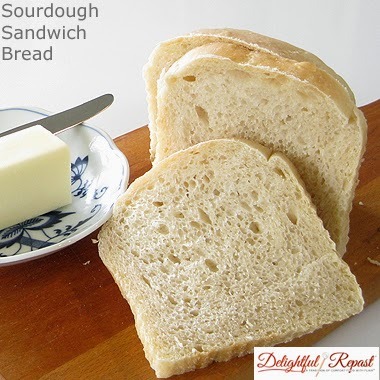 Sourdough bread is my absolute favorite, but I've never tried to make it. I'm feeling inspired to give it a try after reading your post. I had never heard of the "starter" either and find it very interesting. Thank you for sharing! Thank you, ALAFW! Glad you're feeling inspired to give it a try! Do let me know if you have any questions and keep me posted on your progress. I received a sourdough starter from someone almost 14 years ago, that was supposedly from the Civil War, and I've been making bread with it ever since. Your bread looks so good, Jean. I've also read of the importance of the lactobacillus which the sourdough bread has, which adds to its health benefits. Aren't we the healthy ones? I'm addicted to this bread and have a piece of toast from it every morning! How fun! Yes, Kitty, we are the healthy ones! :D You sound just like my husband, addicted to the sourdough bread (except, unlike him, *you* actually make the bread as well). i wish i had the time to try out this recipe! Thanks, Ashley. What a beautiful childhood memory of your dad! Annette, too funny! Tell your hubby not to worry - it *looks* way more complicated than it *is*! You can do this. Hello! I just purchased a Pullman pan to make "regular" shaped loaves of sourdough, and that's how I found your site. I appreciate the recipe but hope you can clarify how the recipe changes if you already have a healthy sourdough culture going? I keep mine at room temperature and feed it 2x/day. I'm guessing I can skip the first few steps of your recipe, but I'd like to know exactly how much starter I should be including in this recipe. Thank you! Hi, Joan! No changes. I also have a healthy sourdough culture going, but I keep just a small amount in a half-pint canning jar in the refrigerator and feed it just once a week when I make two loaves for the week. But whether your stored starter is refrigerated or room temperature, just take 4 tablespoons out of the storage container, as called for in Step 1, and proceed with Step 1. This means the recipe will work for everyone, regardless of what hydration their starter is. If I just said, say, 3 cups of starter, one person might have a very wet starter and another might have quite a dry starter, and then that would throw everything off. Does this make sense? If not, let me know, and we'll work on this until we get it figured out for you!